Innkeepers Denise and Dean Biechler, have lived at the end of 160th St., for nearly 40 years. They were friends with four of the Grandad's Farm generations and were thrilled when the Getz/Vance family approached them about buying it. Acquisition of Grandad's Farm helps expand the dreams the Biechlers have shared with their children to establish a farm that uses sustainable farming practices, nourishing both the soil and their family. They are proud to be able to share the beauty of the Skunk River Valley, the beauty of both Grandad's Farm and RiverRidge Farm, and the farming practices recommended by the leaders in sustainable agriculture. Dean recently retired from Iowa State University as an instructor in the Biomedical, Pre-medical Illustration Program. He has operated a free-lance illustration studio from his home for many years. 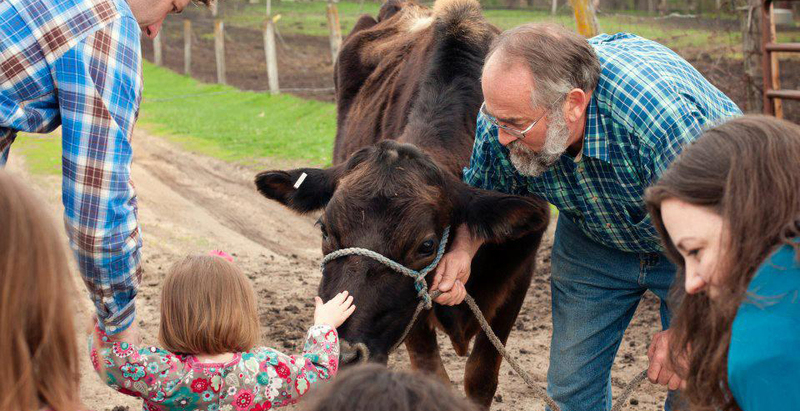 He is also a farmer who raises extensive vegetable gardens, chickens, eggs, grass fed beef, and hay. Dean has a special interest in birds. He has built and maintained a 50 house bluebird trail for the past 30 years, fledging approximately 1000 baby bluebirds over those years. Denise taught high school English for 32 years. She works along with Dean on the farm. She has a special interest in wildflowers and garden blooms. Denise loves literature and movies with interesting characters and good stories.